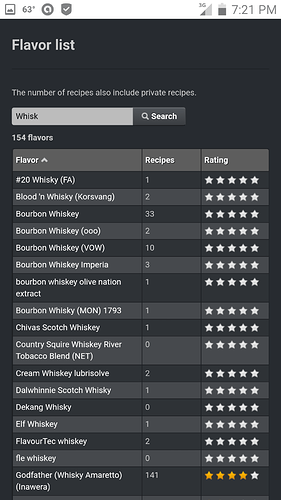 I just searched through 10484 flavours I have in a database and there is no irish whisky (or whiskey) listed - lots of irish creams but no whiskey. There’s quite a few ‘whisk’ to wade through (at least 7 pages)… Don’t recall any brands that are specifically Irish though. You da man, thanks I’ll have t fake it with TFA’s Kentucky bourbon. There are several Whiskey flavors out there. This is just a divine vape for bourbon lovers. I think the closest would be FA whiskey with 1 or 2 drops of Oakwood. Might get yah close. BCV offers Tennessee Whiskey (Sour Mash/Jack Daniels) and a scotch whiskey. Hands down my favorite is KY Bourbon by TFA.